*May be omitted with a price reduction if mortgages are not offered. Each report leverages the power of the AffirmX patented technology, which utilizes a cloud-based platform to make the exchange of data between your institution and our experts comfortably manageable, resulting in minimal disruption to your staff and a major pricing breakthrough for your compliance budget. We don’t leave you guessing when it comes to price; pricing is based on your asset size, using the following sliding scale, so you’ll know exactly what you’ll pay. 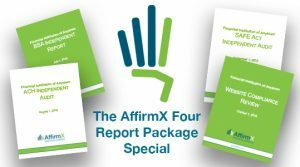 To book your AffirmX Four Report Package, or for more information, contact our sales team or call toll free at 1-888-972-3624.